Clinton County Engineer Jeff Linkous, left, is sworn in by State Sen. Bob Peterson (R-17th District). 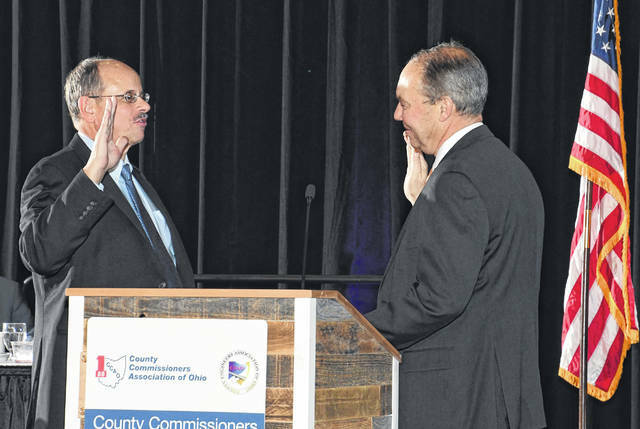 The County Engineers Association of Ohio (CEAO) installed Jeff Linkous, Clinton County Engineer, as their president during the County Commissioners Association of Ohio (CCAO) and CEAO Winter Conference in December. County engineers are responsible for the maintenance, repair and capital improvements of county highways, roads and bridges in Ohio. County engineers are responsible for 28,974 miles of urban and rural roadways and 26,105 bridges in Ohio. Since 1940, the CEAO has worked to unify its members in their goal to provide the highest quality transportation, surveying, drainage and land record keeping services. Linkous is a licensed professional engineer and surveyor and was elected Clinton County engineer in 2008. Prior to becoming the county engineer, he served as deputy county engineer for Clinton County since 1980. He is a 1980 graduate of the University of Cincinnati with a bachelor’s degree in Civil Engineering. Linkous was chosen by his peers to receive the County Engineer of the Year award of the 88 counties in Ohio. He has also worked with the Ohio Department of Transportation to develop and implement the federal/state funding exchange process which allows the counties to swap federal money for state money on projects. This streamlines the process, resulting in savings of time and money. In addition to his involvement in the association, he serves on the District 10 Integrating Committee of the Ohio Public Works Commissioner and is Chairman of the District Executive Committee. Locally, he is Chairman of the County Community Improvement Corporation, a member of the Downtown Wilmington Community Improvement Corporation and a member of the Local Emergency Planning Commission. He is also actively involved with the Clinton Trails Committee and currently serves as President of the Board of Directors for the Wilmington Public Library. https://www.wnewsj.com/wp-content/uploads/sites/22/2019/01/web1_CEAO_12_10_18_0222-1-.jpgClinton County Engineer Jeff Linkous, left, is sworn in by State Sen. Bob Peterson (R-17th District).